These Limited Edition Lemon Twist Oreo cookies don’t have a twist that forces you to ride the suspense pony like a typical M. Night Shyamalan movie does. They’re just two golden vanilla Oreo cookies with lemon-flavored creme sandwiched between them, so they’re pretty straight forward. According to the front of the packaging, they’re made with “natural flavor with other natural flavor.” But after reading the ingredients list, I saw dead people…I mean, I saw it’s also made with artificial flavor. Okay, the only twist involved with these Limited Edition Lemon Twist Oreo cookies is the action of twisting and not the unexpected plot change in a work of fiction that M. Night Shyamalan will only be known for when directing career is over. Creme lickers know what I’m talking about. Stick out your tongue, if you feel me. I twisted the top off of several Lemon Twist Oreo cookies and licked the creme like I was living in the 1980s and needed to seal an envelope and adhere a 20-cent first class stamp to the front of it. What did my mastication muscles discover? I thought the creme was going to taste like a wood table that’s been recently cleaned with lemon Pledge, and I prepared for that by licking a Pledge cleaned table, but the creme tasted nothing like that. Instead, it had little lemon sourness that’s quickly joined with a vanilla sweetness. However, there’s a slight artificial lemon aftertaste, which you’ll relive after every post-Lemon Twist Oreo burp. The lemon creme was tasty, but licking it wasn’t as satisfying as French kissing the vanilla creme in an original Oreo cookie. What was satisfying was keeping the top Golden Oreo cookie on and keeping my tongue in my mouth, because eating a complete Lemon Twist Oreo was delightful. The lemon creme and Golden Oreo cookies work extremely well together, creating a flavor similar to lemon meringue. The vanilla flavor of the cookies dampened the sourness of the lemon creme and enhanced the Oreo’s sweetness, producing a pleasant balance of sweet and sour. I have to say the Limited Edition Lemon Twist Oreo cookies are one of the best limited edition Oreo varieties I’ve tried, and I would eat the entire package right now, but I have to ration them because these cookies are hard to find. Pros: Delightful. Tastes great when consumed as a whole cookie. One of the best limited edition Oreo cookies. Nice balance of sweet and sour. When first class stamps were 20 cents. TIB readers being awesome. Cons: Licking lemon creme is not as satisfying as licking vanilla Oreo creme. Contains HFCS, if that bothers you. Damn hard to find. Riding the suspense pony during a typical M. Night Shyamalan movie. For some of us, HFCS is a pro. I’ve tasted cookies with evaporated cane juice or beet juice concentrate, and even a brainwashed Cookie Monster would not approve. I’ve never heard of a Woodman’s, but I’m going to google maps this nonsense and getting myself to one. Woodman’s is a Wisconsin/Illinois chain, so you’ve got a long drive ahead of you. Remember Lemon Coolers (by Sunshine)? Those were awesome. It’s funny that the most boring sounding (compared to candy corn, birthday cake, etc) Oreos are actually the best. I remember lemon sandwich cookies by Sunshine. Those were good. These look fantastic, I hope Oreo bring them to the UK! I’m a sucker for all things lemon…for some reason I was hoping these would be the chocalate cookie with lemon flavor creme. I would still trample over cats to buy these. Hell, I would trample over cats for any reason. Damn this post makes me miss Woodman’s. Woodman’s has everything, including great commercials. I think you have to try looking at the smaller grocery stores. I believe Target or Walmart don’t carry it. Certain grcoery stores in some areas are licensed to carry certain products. Here in MD we have a chain called Giant which has Cookies and Cream Oreos. I have not seen them in any other store. Trouble with that is there really aren’t any “small” grocery stores where I live (and I’m in a small town, go figure). The smallest one I know of nearby is a Fresh Market, so so much for that. Surprised that bigger stores wouldn’t carry them, even around here. I finally found these – they are AWESOME!! I’ve already gone through one and bought two more. One is destined for the freezer with a “Do not open until Spring” label. If you live in a Food Lion area see if they have them. I kept checking Wal-Mart thinking I would find them there. No luck. Walked into Food Lion not expecting to see them, and there they were. A huge display right at the front entrance. I so love anything lemon. Hearing about these has both made my day in the “these are gonna be so good!” category, and ruined my hopes for decent weight loss this week, all at the same time. These never made it to Baton Rouge, LA and I really wanted to try them. So GOOD bring them back! Found these by chance at our Food Lion before Christmas. My husband and I both love them. I’m a big lemon fan and these were great, not too sweet with just a little tang. The cashier laughed at me because I bought a couple of bags every week. Being limited edition I figured they’d be gone soon and they were. Still have 3 packs but would love to be able to buy them year round. Any chance??? Best Oreo you make. Why are they only limited edition. They should be year round!!!!! Was trying to figure out just how limited these Oreos are and stumbled across your review…I agree that these taste so good! They have just the right amount of tangy/tart and the Golden Oreo cracker balances it out perfectly! Hope they bring these back, we love them more than normal oreos! How do we petition Nabisco to bring this cookie back? The best lemon cookie I have ever had and I am 60 yrs old. I’ve eaten a lot of lemon cookies and this is the best by far. Please bring them back and make sure they get to Georgia. Actually, it’s back, but still a little hard to find. just wanted to let you know that I just bought a bag of lemon oreos at a Brookshires grocery store in southern Arkansas. hopefully you will have them very soon, so get them while you can before they are gone. Hooray, They are back. I just bought a bag of them at a Brookshires grocery store in southern Arkansas. they are the 2013 limited edition. get them while you can. OK I hear so much about the lemon Oreo’s and cant find them anywhere. I live in South Carolina and I and many others want to try them. None at Walmart, Piggly Wiggly or Food Lion. Come on people we want to try them to. Where can we find them?????? I live in Georgetown, SC between Myrtle Beach and Charleston SC. Finally found these at a Winn Dixie in Baton Rouge, LA! They weren’t even on the cookie aisle. They were on free standing display on the bread aisle. I tried the lemon Oreos and I am hooked. I can’t find them in my city..Oshkosh wi. Help!!!!! My wife and I bought some of the lemon cookies and now we cannot find them anywhere? When will they be back or where can you find them in Texas? These cookies are verrrrrrry good!!! Want more, but can’t find them. These are the best Lemon cookies I ever had, please don’t discontinue these. These just showed up at my Air Force Base Commissary at the beginning of the month. They’re so amazing. I imagined they’d be a throwback to the Girl Scouts’ lemon crème sandwich cookies I used to enjoy before they became the single-layer ‘lemonades’ with half the icing. Surprisingly, they were even better than the classic Girl Scouts treat, the crème tasting identical to them, and with cookies that actually don’t crumble before they come out of the package. Also, a very interesting note for everyone here. That packaging pictured in the article is labeled ‘lemon twist’, and was extremely limited & hard to find (which explains why I never saw it in 2012/2013). However, the Oreos that appeared at my base commissary were in excellent supply, and have a different packaging. 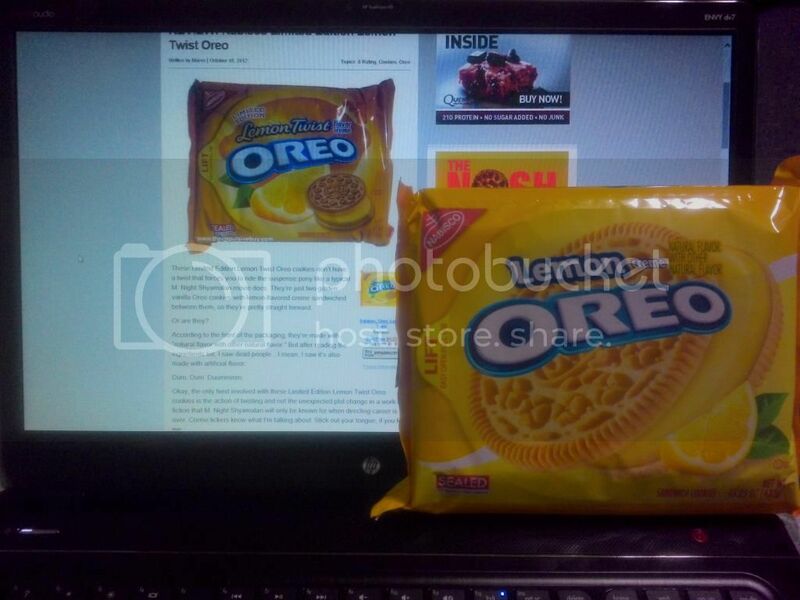 ‘lemon twist’ has now been changed to ‘Lemon’, and ‘limited edition’ was removed from the packaging, suggesting that Lemon Oreos are now a permanent addition to the lineup of Oreo flavors. I Want the Lemon Oreos back they are so good and now I can’t find them anywhere. Why is it when u find something good then they stop caring it and u can’t find it any more. I want them bad please. I am so disappointed that the Oreo Lemon Twist cookie has stoppedselling the product in the stores! Everytime I go to my grocery stores in town no one has them available! Now if a product like the Lemon Twist Oreo cookies are a HOT item why discontinue them? Obviously if they sold so well as a limited edition product why stop production?? I am really disappointed as I go to the cookie aisle and really check the shelf out for that cookie! Really, I do not want to purchase any other Oreo cookie no matter how many other choices I have! So Nabisco you have lost my business in the cookie section. Bring back the Lemon Oreo. Birthday cake Oreos? Give me a break. Head or Tails and Lemon. The best flavors. Whoever is a part of the Nabisco marketing department and production team needs to use some common sense when a product is in high demand as the Lemon Oreo is enjoyed by so many folks! Are you making the cookie a commodity? I feel you are anticipating a big marketing program and will roll the Lemon Oreo out on the shelves again! Campaigning! Don’t wait too long because another company will unveil their new lemon cookie! Please bring back the lemon Oreo cookies…best ever!